Garden summer houses have regularly proven to be a good investment for any property owner due to a remarkable increase of property market values for those properties. A cosy outdoor living space makes the whole property so much more desirable that the property value will take an immediate boost. However, how can you create such a building in the best way? What features does it need to really make a difference? How do you proceed to make it a such a lucrative and remarkable investment? 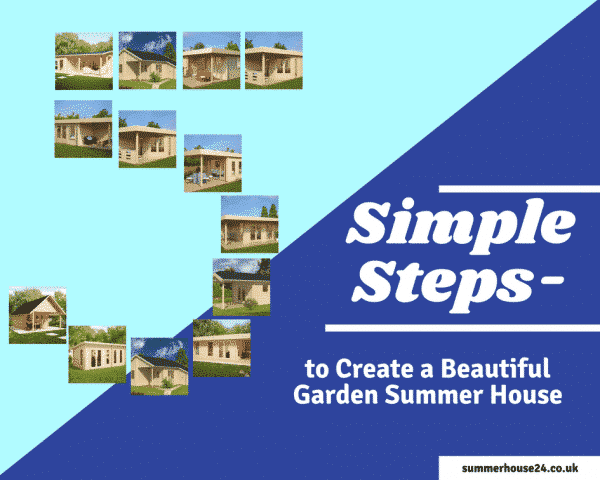 We will show you 5 simple steps to create your best garden summer house that will compliment your main building, transform your property into a desired home with a high market value, and give you some joy to use it for your own leisure activities like writing, crafting, meditating, reading, partying, watching films, playing music, working creatively or whatever it is that makes your life enjoyable. You can transform your garden summer house into your own sanctuary, far off the hustle and bustle of the main house, far away from the noisy street, deep down in the lush green garden where you can relax and enjoy your life without any disturbances. Do you want to design a stylish, sturdy and functional garden summer house on your own? It is really important that design and floor plan perfectly match your requirements and represent your own personal style. Or will you choose one of the many blueprints freely available on the internet? Do you plan to have an architect do the job, who will also look after building permissions, materials, and a suitable construction crew? On the other hand, there is a huge variability of ready-made garden summer houses to choose from on the internet. Keeping in mind that you are looking for your personal style, a reflection of your personality, perfect windows, perfect roof, perfect layout, it sure would be the option with the best cost-effectiveness to find a ready-made model that comes closest, and then cooperate with the manufacturer for the last necessary modifications. Location is the number one key feature for garden summer houses just the same as for any other properties. So depending on the size of your garden, finding the right spot might be a challenge. You probably don’t want it right in the centre but somewhere tucked away at a more distant spot maybe surrounded by some trees to give you a kind of forest feeling when you stay there. On the other hand there is logistics to be thought about: Water and electricity will in most cases be necessary. If you plan your garden office there, Wi-Fi might be a good idea, and some infrastructure for heating might also come from the house, be it hot water from the central heating for an underfloor heating in your garden summer house, or a pipe for gas for a gas heating. So, it is a question of effort how far you want to go away from the main house. Logistics can be managed, finding the right spot that provides the right atmosphere for you should be the number one priority here. Already before choosing your garden summer house design, you will have had an idea about a kind of theme in your mind about how your summer house should look like. Cottage style, Scandinavian style, plantation style, minimalistic style… Remember: Interior and exterior should form a perfect match and all of your perfect garden summer house should differ from the style you maintain in the main house, and at the same time compliment it. Of course, your intended usage will also play a role in this choice. A summer house to store things in, keep the gardening tools and bikes will have another style than a garden house accommodating guests, or a garden lounge. The perfect shade will play a big role in the general look of your garden summer house. Blue would be a nice colour for a summer house on a little hill, calming green might be the right colour for a garden summer house tucked away between some trees to give it a secluded country-style feel. White combines well with many colours, natural wood colour can be preserved with colours containing UV-blockers, and many kinds of wood stains modify the natural wood colour in different tones that don’t cover the natural grain. Furnishings and finishings inside your new garden summer house are entirely up to you: You could use finds from flea-markets or junk shops, or you could use furniture as extravagant as you can get for your relaxation oasis in the garden. Create your own space, with pieces, decoration, prints, signs. Use nostalgic themes, or funny memes, use bright colours or soft ones, make it noble and elegant, or cosy and rustic. Just remember: Here you have the unique chance to try something new, something completely different from what you have all day in the main house and something contemporary expressing your own style. Once your dream garden summer house is finished, you can put the final touches to the garden immediately surrounding the summer house. Bushes, flowers, maybe a little pond, maybe a scaffold over the way to the summer house covered with some climbing flowers? The footpath leading to your little outhouse is a design element in itself. Give it some thought. Rather than letting it go straight to the entrance, you might want to give it some curves, plaster it with natural rock or just make stepping stones embedded in the lawn.